The universally accepted function of religion is to protect society from social and moral degradation and to guide its destiny in such a way as to achieve the greatest good of the largest number of people. Whenever the universal human values are on the decline, religion is thought to have failed in doing its duty of guiding the Society. The more a religion tends to unite people and to strive for the service of humanity, the nearer it is to its aim. The world has seen many religions at different times. Sikhism is one of them and perhaps the latest. Sikhism is an endeavour to create a union of all those who love God and serve humanity. A devout Sikh respects the adherents of all other faiths irrespective of the differences of creed and ways of worship. The example was set by Guru Nanak who made friend with an untouchable (low caste) Muslim named Mardana and kept his friendship till death without even once asking him to renounce Islam and to accept the Guru's religion. The same is reflected in the Sikh Holy Scripture, Sri Guru Granth Sahib, regarded as the Living (Shabad or Word) Guru, of the Sikhs. The universal teachings of Sri Guru Granth Sahib is for the benefit of humankind. Side by side with the hymns of Sikh Gurus are recorded the hymns of a king, a Brahman, a barber, a Muslim and an untouchable (so-called shudra) all professing different religions. Its message, as the Guru himself put it: "is for all the four castes" *and the whole of humanity. Guru Gobind Singh, the tenth Guru of the Sikhs, had a number of Muslims in his army fighting against the tyrannical Mughal empire. Last but not least the foundation stone of the Holiest shrine of the Sikhs, Sri Harimandar Sahib (also known as the Golden Temple) was laid by a Muslim, Sayeen Mian Mir. 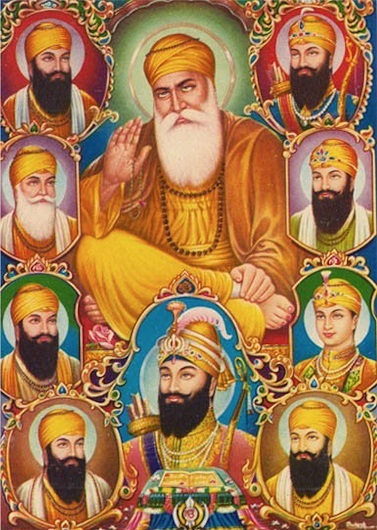 For the Sikh the whole humanity is a united family, a brotherhood under one God. Duncan Greenless has summed up Sikhism as "the religion taught through Guru Nanak in the forms of the Ten Gurus and now through the Guru Granth Sahib and the whole community of disciples. It is a practical way of life, leading man straight to his goal, and does not involve itself in verbose theorising." Sikhism has always been very clear about the discipline required of a Sikh. In fact, Guru Ram Das, the fourth Guru Nanak, laid down an aspect of the discipline required for a Sikh's everyday life. Thus shall his sins and errors-be erased. Sitting or standing, he should meditate on God's Name. will please the Guru's heart. who is by the Lord's mercy so guided. Who himself repeats Gods name, and leads others to do so." Meditation on the Name of God (Naam Simran) was and is the most important thing for Sikhs living by a discipline prescribed clearly by the Guru. As per the constitution The Sikh Missionary Society follow the the code of conduct as laid down by the REHAT MARYADA approved and published by Shromani Gurdwara Prabandhak Committee, Amritsar and Sri Akal Takhat Sahib. The Rehat Maryada is also available to read online in the Publications section. Most of the literature on Sikhism, Sikh History, tradition and culture is supplied free of charge to anyone who is interested in Sikhism.